Can I Give My Cat Peas? We don’t tend to think of most vegetables as child-friendly foods. Even those of us who consider ourselves to be progressive, health-obsessed, whole food-loving parents often have trouble getting our children to eat their leafy greens. However, there are a handful of delicious veggies that our kids will gobble up even in the form of baby food, and by far the most beloved child-friendly vegetable is the pea. 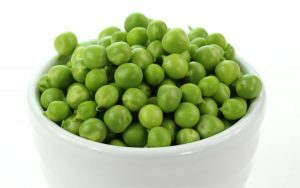 We love peas—they are little and round (so they’re fun to roll across the table), they are soft (for ease of chewing), they are colorful, and they are full of healthy protein, carbohydrates, and an abundance of health-boosting micronutrients. No wonder peas are so popular among parents and kids alike! But what about pet parents? After all, many of us have children of the furry, four-legged variety, and we are just as picky about what we feed our babies as the parents of two-legged children. Though dogs can and will eat anything, cats are trickier—and tinier, which means one wrong move can make them horribly sick. So what about seemingly safe vegetables like peas? Can cats have peas? The verdict: yes, cats can eat peas! Peas are one of the few vegetables that most cats seem to enjoy, and they are small enough that they usually do not pose a choking hazard. They are affordable and full of micronutrients that may provide a slight nutritional boost for active cats. Just make sure to practice moderation, and remember that your cat does require nutrition that can’t be found in plant foods like peas. Benefits of Feeding Your Cat Peas? So, what’s great about peas (aside from their delicious flavor)? 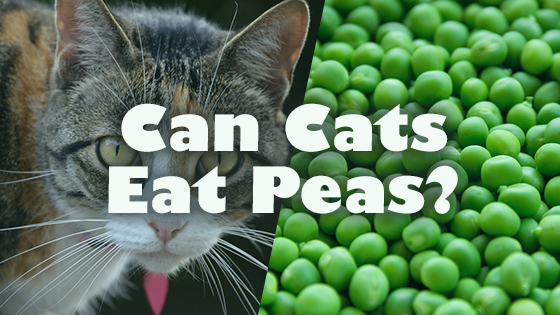 While cats probably can’t get the same health benefits from peas that we can, they aren’t completely nutritionally empty. Peas are low in fat, but high in protein and complex carbohydrates, which can support muscle growth and provide energy for active cats. Cats need a diet that is higher in protein than the typical healthy human diet, so when choosing feline-friendly vegetables, high-protein options are the best. Peas are a favorite among human athletes because of their high nutrient content, low fat content, and relative ease of digestion. However, it’s important to note that peas are not a suitable source of amino acids for your cat—since our feline friends are obligate carnivores, they are designed to meet their amino acid needs by eating the flesh of prey animals, which has a different amino acid profile. Unfortunately, your pretty little Persian is not biologically built for a vegetarian diet. If your cat relies too heavily on pea protein, they may suffer from a deficiency of the amino acid taurine. Dietary taurine is absolutely necessary for your cat to maintain eye health, a functioning digestive system, a strong immune system, and normal, healthy functioning of heart tissue. Symptoms of taurine deficiency may not show up for two whole years, and by then, damage may be irreversible. This is why it is vital that you make sure your cat is getting enough taurine in their diet! If you suspect that your cat may be deficient, talk to your vet about a supplement. In addition to healthy protein and carbohydrates, peas contain vitamin B1, potassium, vitamin C, iron, magnesium, copper, and fiber, all of which can help support cat health. Fiber in particular may have some digestive benefits. Though cats should not eat very much fiber (obligate carnivores would eat hardly any plant fiber at all in the wild), those who struggle with sluggish digestion may benefit from eating peas a few times a week. Soluble plant fiber turns into a slippery, jelly-like substance when it absorbs water, which can help get things moving through your cat’s intestines once again. Peas are one of the plant foods which are most often added to commercial cat food brands because of their fiber content. While peas are not at all toxic to cats, it’s important not to overdo it. In addition to nutritional deficiencies, eating too many peas can throw your cat’s digestion into disarray—cats, unlike people, are not built to digest large amounts of starchy carbohydrates, and may wind up suffering from upset stomach, bloating, diarrhea, constipation, or vomiting. Eating too much extra food (even vegetables!) can also cause weight gain, which can lead to obesity. Even though peas are vegetables, their high starch content means that they are more caloric than many other vegetables, so remember to use peas as a treat and not a staple. In conclusion, peas are an excellent treat option for your cat. They are full of protein and healthy carbohydrates, and they can provide a modest amount of several important vitamins and minerals, as well as fiber. To help your carnivorous cat digest this starchy vegetable, serve it cooked. Just remember that peas, which are not nutritionally complete, should be a supplement or a treat, not a mainstay in your cat’s diet. Can Dogs Eat Ham? Can Cats Eat Crackers?